24 gauge wire ~ about 10"
Start threading your rhinestones onto the wire. For the first three, we will be going diagonally; with the stone facing you, going in through the upper left hole and coming out from the bottom right hole. I found it easier doing it from the back (lol!! ), so in through bottom left and out through upper right. For the fourth stone, slide it in through the two top (stone facing you) holes; bottom two if doing it from the back, as shown above. Now for the last three, we'll be doing them diagonally again, opposite of the first three. So doing it from the back (hee hee hee!) in through the upper left and out through the bottom right. With the stone facing you, in through the bottom left and out through the upper right. Push the stones together firmly and bend the ends of the wire at a 90 degree angle to the stones. If the stones wiggle too much, add a drop of super glue in between them, where you've threaded the wire through. Use your jewelry pliers to bend the wire end into a loop and wrap the excess around the base of the loop. Repeat on the other side. Gather your 2 pieces of chain and 2 pieces of ribbon. Using your jump rings, attach each piece of chain to each end of the rhinestone wire loops. Tie a piece of ribbon to each end of the chain. Et voila! C'est tres jolie! With the ribbon closure, you can wear the necklace higher or lower, making it super versatile! 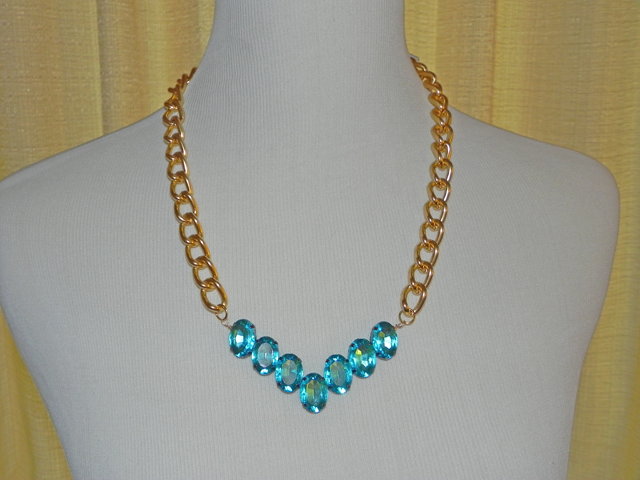 Get creative ~ use different colors or shapes for the stones, use different sized chain, etc. Make it your own!